Our range of products include out flow heaters. 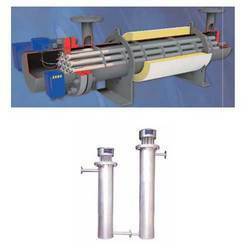 We are one of the leading manufacturers and exporters of a wide range of Out Flow Heaters. Matrusree™ out flow heater is a flow-through electrical heater, ideal for heating of oil or water. Its heat load capacities range from 3 to 200 kw, with design conditions up to 16 bar and 160°c. They are generally mounted horizontally, but is also available as vertical mounting with different MOC. These heaters are designed specially as suction heaters but can also be designed for out flow heaters as well as immersion heaters application. Heating of viscous materials, in large storage tanks, to pumping temperatures. Maintaining an entire tank of viscous fluids such as fuel oil or asphalt at pumping temperatures is very costly. In many applications it is not practical or economical because the tanks are located underground or are not insulated. Type matrusree suction oil heaters are a cost-effective solution to this problem. Suction heaters are specifically designed to heat only that amount of material that is to be pumped from a large storage tank. The outlet nozzle is attached to the pump suction. The heater heats the material inside the heater pipe body which is then drawn through the heater into the suction side of the pump. This technique saves substantial energy costs since it is not necessary to heat the entire contents of the tank to draw off relatively small amounts of viscous materials. Complete weather-proof construction makes these heaters perfect for installation in large outdoor storage tanks. Large heater inlet provides smooth, full-flow through the heater. Matrusree circulation heaters circulation heaters are designed to be installed outdoors in exposed areas. Enclosures are designed to be moisture resistant or moisture and explosion resistant. Low watt density elements make the heaters safe to use on most viscous liquids. Carbonization is minimized. Thermostats/ temperature controls and control panels: Matrusree out flow heaters are provided with temperature controls to control fluid outlet temperatures and limit internal temperatures under abnormal depending on customer specifications, matrusree suction heaters may be supplied with factory equipped ar thermostats / temperature sensors in case of digital temperature controllers other panel accessories. Integral or remote mounted control panels with electronic controls and solid state (ssr) or contactor power controllers can be provided using virtually any combination of control devices. Looking for Flow Heaters ?